The Take That star's recognition comes just days after he put together the triumphant Diamond Jubilee concert for the Queen at Buckingham Palace. He is also at number one with his Jubilee anthem Sing, and appears to have become the "go to" pop star for royal occasions. He said: "I'm absolutely thrilled and feel very privileged to be in the company of so many brilliant people who I know have received an OBE. Growing up I never dreamt that one day I'd be getting one myself. I enjoy every minute of the work I do, with a lot of it being a reward in itself, so for somebody to decide I should get recognised for that is just amazing." He added: "My family are very proud." 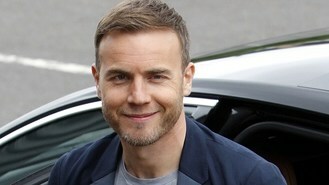 X Factor judge Gary, 41, has been honoured for his services to the entertainment industry and to charity. TV choirmaster Gareth Malone, who also performed at the Jubilee concert, was thrilled to be given an OBE. He said: "Over the past ten years, encouraging people to sing has been a labour of love so it's wonderful to be recognised in this way." Other musical recipients include There's Nothing Like This singer Omar, and Richard Stilgoe, who made his name for the clever ditties he composed on BBC1 shows Nationwide and That's Life. Meanwhile, funnyman Armando Iannucci said he could not help but feel slightly "guilty" about accepting his OBE for services to broadcasting. The Thick Of It Creator joked: "I just hope it's not an attempt by the Government to stop me because that's not going to happen."